The famed Chem Dawg, aka Chemdawg, is one of the most potent Marijuana strains in existence. Originating in mystery and legend, Chem Dawg was supposedly found as a seed in a bag of high-quality bud bought by the strains%u2019 namesake, who is now breeding various new varieties with these genetics. Chem Dawg is powerful medicine, with a strong smell of pine-sol and jet fuel, and a very strong high %u2013 which can be too strong and anxiety-producing for less-experienced smokers. As the progenitor of many Kush and Diesel varieties, Chem Dawg is a proud parent of many currently popular marijuana strains. 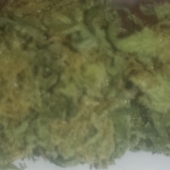 a legendary strain that lives up to the hype, a great mix of head and body effects.